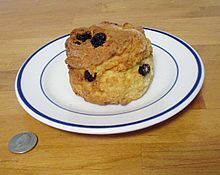 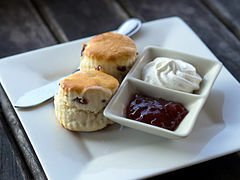 Thus, scone may derive from the Middle Dutch schoonbrood (fine white bread), from schoon (pure, clean) and brood (bread), or it may derive from the Scots Gaelic term sgonn meaning a shapeless mass or large mouthful. 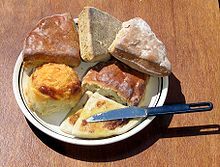 The Middle Low German term schöne meaning fine bread may also have played a role in the origination of this word. 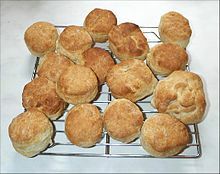 And if the explanation put forward by Sheila MacNiven Cameron be true, the word may also be based on the town of Scone (/skuːn/ ( listen)) (Scots: Scuin, Scottish Gaelic: Sgàin) in Scotland, the ancient capital of that country – where Scottish monarchs were still crowned, even after the capital was moved to Perth, then to Edinburgh (and on whose Stone of Scone the monarchs of the United Kingdom are still crowned today).